The 2017 Feast of Tabernacles was spectacular and colorful as dynamic worship teams and annointed speakers gathered in Jerusalem to celebrate the most high God and His city. 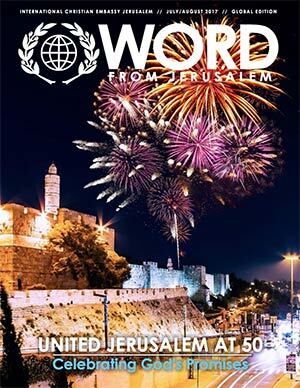 The Feast also commemorated the liberation of Jerusalem 50 years ago and was honored by the participation of veteran paratroopers who took part in freeing the city. The ICEJ Arise Team was privileged and excited to lead a group of young adults around the Land of Israel, and pleased to report that many returned home with incredible breakthroughs, a renewed purpose for their lives, and a heart for God’s people in Israel! 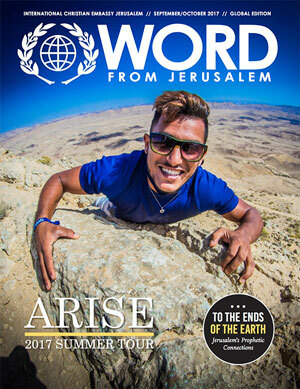 Arise is a life-changing trip for many young adults. 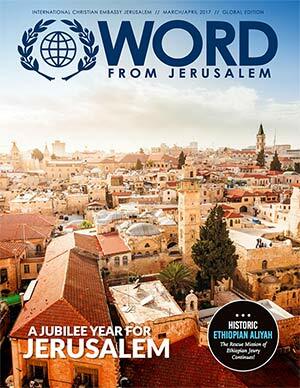 This year marks a special Jubilee for Jerusalem. 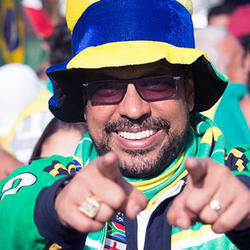 The fiftieth Jubilee is a divine declaration that marks the favor of the Lord. It is a year when possessions revert to their original owners – a year of release. 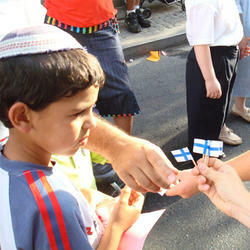 Therefore we can expect God to touch Jerusalem and its inhabitants in a unique way this year. 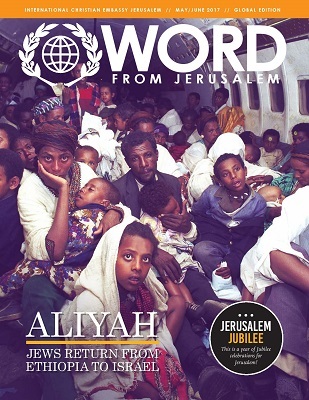 Inside: "Extracting Extraordinary Blessing," "Longing for Zion," updates on Ethiopian and worldwide Aliyah, and more. 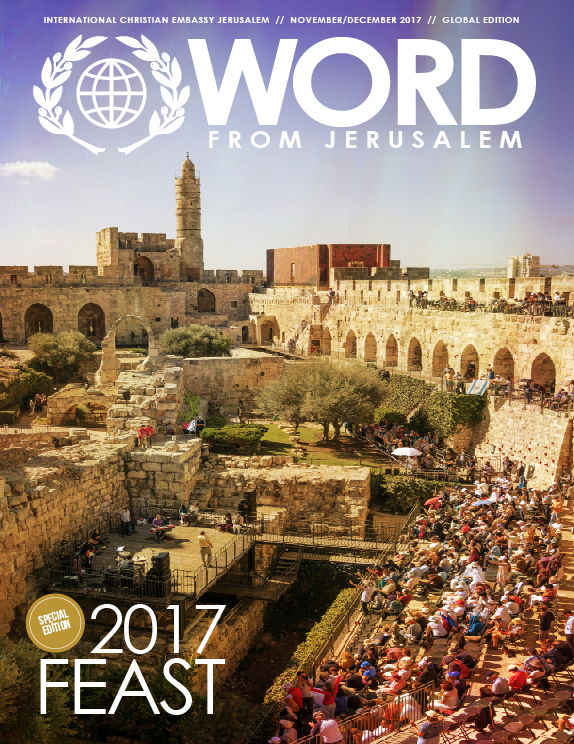 Inside: "A Jubilee Year for Jerusalem," "The Case for Returning (the US Embassy) to Jerusalem," updates on the Home for Holocaust Survivors and more. 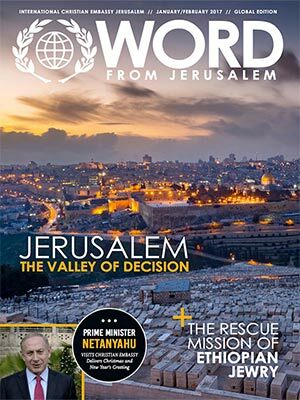 From the very beginning, Jerusalem has been a city of decision. The first time we read about it, we find Abraham returning from a successful campaign against four kings who had taken hostages from the city-states of Sodom and Gomorrah. Abraham pursued and defeated the kings, liberated the hostages and brought back a rich bounty of his conquest (Genesis 14). Again we experienced another blessed Feast of Tabernacles. Every year the Lord shows up and blesses beyond our expectations. 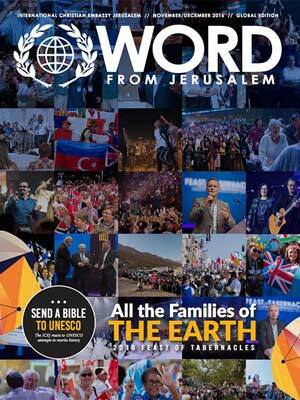 He is faithful to do so, because the Feast of Tabernacles is not the ICEJ’s feast, but it is the Feast of the Lord.